Pocket square matching is a minefield laden exercise to the unaccustomed- this is in part, no thanks to departmental stores like Myers and David Jones, pushing matching tie and pochette sets to mass consumers. Otherwise known as the handkerchief, this humble square of silk, cotton, linen or occasionally wool, brings panache to an otherwise simple ensemble. While there’s nothing wrong with simple, that 15″ by 15″ piece of folded cloth separates you from the faceless mass of other suit wearing professionals. The iconic classic look white pocket square with dark suit. Simple “mad men” rectangle fold. Anyone can do this. This is so easy that if your best man has left his handkerchief at home, you could swipe a paper napkin from the buffet table, fold it and pop it in his pocket without a second thought. 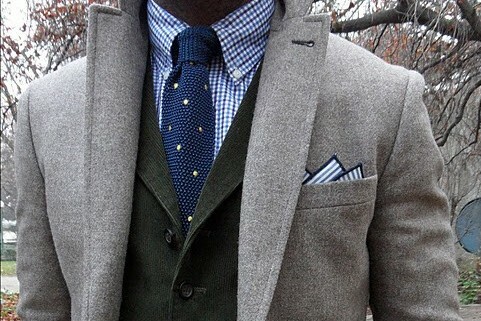 Here, the blue knit tie with spots is matched with a blue edged cotton print pocket square. The stripes play off the gingham checks giving the look added complexity. Here, folded in three peak formation, the sartorialist in question avoids the classic mistake of one-to-one matching with either the tie or his shirt by using a square with stripes. 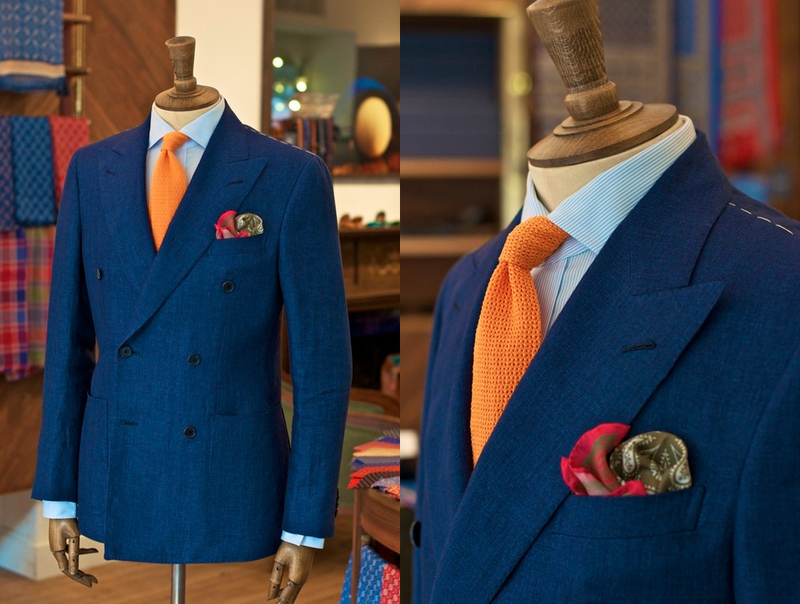 In this ensemble, the orange knit tie is matched with a complimentary red/green pocket square. The lightweight Batik Print Silk Habotai Handkerchief from Drake’s London in khaki with white and pink plays off the orange tie perfectly. In this scenario, the puff “fold” helps make the patterns muted and the eye is drawn first to the splash of magenta rather than the paisley print. 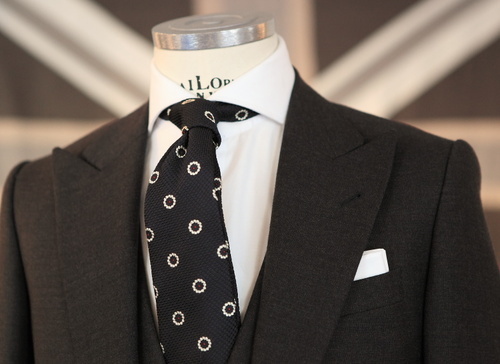 Should the tie be folded in a three peak, greater exposure to the patterns might not work. Blue on blue on blue on blue. Simple yet simultaneously complex. Bronze lapel pin provides accent to the look. Here, my friend and former colleague Sarah Ann Murray, fashion editor for The Rake pulls off a complex texture, tone and pattern ensemble with a few basic geometric elements. The prince of wales check, a blue checked shirt with contrast collar, a blue birdseye tie with diagonal grey stripe and a blue herringbone scarf. 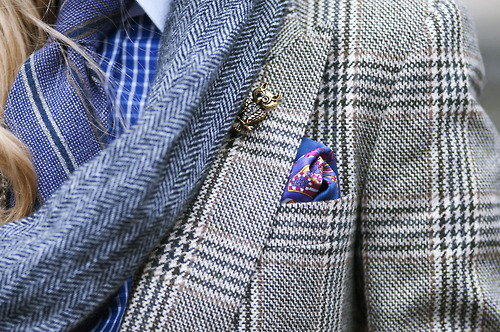 The coup de grâce comes from the blue patterned pocket square. All I can say is, attempt this combination at your own risk- experimentation with what works is key. You are most right! I have used a bastardised English version of a French term- I will correct this affront immediately. Hi Jonathan, for a wedding with a black suit white shirt & Bordeaux bow tie, the safe choice would be a white pocket square I imagine. Would you suggest a different colour?